Ineptitude in government has been glorified by all those deceiving the good people of Anambra state with the slogan: 'nkea bu nke anyi'. First and foremost, let us look at the issue of recession. Nigeria was said to be in recession. But, it should be recalled that Anambra had goog savings under former Governor Peter Obi's watch such that the recession rarely affected the state. The state government was able to pay the paltry sums in salary civil servants receive in the state with relative ease. While Obi administration was ingenious enough to buy vehicles and computers and distribute same to all the schools in Anambra state, government and private schools alike, the Obiano administration only recently demonstrated the capacity of the state government to buy vehicles that will go round the state when the Governor bought shuttle buses and distributed same to all APGA ward chairmen in the state in his desperation for an undeserved second term in office. Under Obiano's watch, road construction in Anambra is at a standstill. Lest we forget, Obiano promised Anambra people that after his government in Anambra state, succeeding governments in the state will no longer have any business constructing roads as he would have finished doing all Anambra roads. He equally promised to launch operation zero pothole on existing roads in the state; but, today, potholes have returned in many Anambra roads. A typical example is the Nnewi-Ozubulu-Ihembosi-Okija road which is bedeviled with alarming potholes punctuating every pole's distance on the road. Indeed, Anambra people's hopes have been dashed by a government that cannot keep any of its campaign promises. Under the triple C theory, Obiano committed himself to an oath of completing all the projects started by Obi administration. That is completion. He promised to commission same. That is commissioning. He equally vowed to commence new ones. That is commencement. Looking at his scorecard, four years down the line, one cannot mention any projects commenced by Peter Obi which Obiano has deemed fit to complete. Is it the shopping mall at Nnewi? Is it the Agulu lake hotel? Is it the Ifite-Ester Obiakor road in Awka metropolis, just to name a few? Suffice it to say that Obiano did not complete the projects initiated by Peter Obi as promised let alone commissioning any one. He simply had commissioners who never commissioned projects. This is ineptitude of the highest degree. If one consider the third 'C' which stands for commencement and marry same together with Obiano's promise to commit about 2% of the state's annual budget to the development of Awka capital territory, one would be at loss because Awka does not resemble a city with such thrust fund. For instance, the Ifite road which is very close to government house is now impassable, despite leading to the prestigious Nnamdi Azikiwe University. Similarly, Agulu, the host town for the university's faculty of pharmaceutical sciences, just a few minutes drive from Awka, is on the verge of being cut off from the state capital due to bad road. Considering rural roads, the government ought to hide its face in shame for not being able to deliver the Ozubulu-Ihembosi-Ukpor road infrastructure to Anambrarians. This particular road is being mentioned in this article to represent other rural roads in the state because of the gravity of havoc wrecked on this road by the Willie Obiano government. He did what is best described as deceitful preconstruction earthmoving activity on the once motorable road, loosening the soil structure and then abandoned the project. That single act has proven to be a precursor to a devastating erosion which is now threatening over 200 buildings in the three communities. This is to mention but a few. But what could be the reason why an incumbent Governor of a state would rather chose to deceive the people he is leading? Anambra was said to be leading other states in local rice production. The truth was however brought to the fore when the President of the federation recognized some states that have done well in rice production and Anambra was not mentioned. This shows that the state government is feeding the public with lies. What about the issue of massive yam production and export from Anambra. Available evidence shows that the yam consumed in Anambra are mostly from Benue and Taraba states. So, where is Anambra yam? What about the export of ugu leaves from Anambra to Europe and America? Through which airports or seaports is this foreign trade being carried out? What is the storage/refrigeration process? How many Anambrarians have been withdrawn from the labour market as a result of this? All these questions should be answered by all those deceiving the people with the slogan: nkea bu nke anyi. The youths in Anambra are the people bearing the incidence of hopelessness in the current administration. Willie Obiano knows a little about the feelings of the people of Anambra state probably because he retired to the United States where he believed he would spend the rest of his life before Peter Obi brought him back to govern the state. If he had any atom of home feeling, the story would certainly have been different. So, how does he epitomize the saying that nkea bu nke anyi? He simply belongs to the US where he must have starched our common wealth ahead of his exit from power. The real one that belongs to us is that man who believes in our state; that man who lives amongst us, that man who knows most of us by our first names, that man who feels our pulses, that man whom God has raised from amongst us, that man who has traversed every nook and cranny of Anambra before venturing into state politics, that man who has the burning desire to turn around the fortunes of our dear state to the glory of God and for the good of the citizenry. Vote him today and tomorrow will be filled with glorious tidings. Tony Nwoye is the man. Tony Nwoye bu nke anyi. Vote Hon. 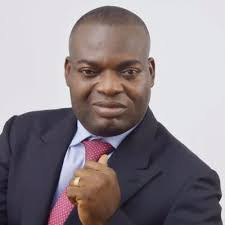 Dr Tony Nwoye for a paradigm shift.